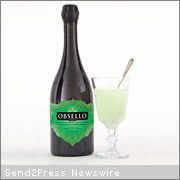 SAN FRANCISCO — Obsello, an authentic Spanish absinthe verte, announces its official entrance into the U.S. market today. Obsello, hand-crafted in the Catalan region of Spain, is the only brand of absinthe readily available in the U.S. that is twice distilled, infused with real herbs including grande wormwood and made with un-aged brandy from the Penedes wine stock. It is an award-winning, premium, authentic absinthe verte that is available in Spain, Australia, Germany and as of today, the U.S. Obsello contains legal, target levels of wormwood that mirror commercial absinthe recipes of 100 years ago. During blind taste tests, Obsello received the highest rating on flavor, color and louche compared to the other readily available products in the U.S. With honey and vanilla undertones and a hypnotic velour texture, the taste of Obsello stands clearly apart from competitor brands. Obsello is being launched in California by Bock Wine and Spirits (www.bock-ws.com). It will also be available nationwide soon from online vendor Kamal Mukherjee at Manhattan-based www.DrinkUpNY.com. Pre-orders are now in progress. Despite its new legality, absinthe is still unregulated in critical areas. For instance, the U.S. government has yet to create a formal, legal definition for absinthe. This ambiguity has enabled some brands to market their beverage under the name of absinthe when in reality, their products stray considerably from original, European absinthe standards. “People want to love absinthe. Now they can,” said Davis. Obsello Absinthe is an award-winning, authentic absinthe that is twice distilled and infused with eight natural herbs including grande wormwood, anise and fennel. Hand-crafted in the Catalan region of Spain, Obsello is made in traditional alembic stills using an un-aged brandy base from the Penedes wine stock. Embracing original absinthe recipes once banned in the early 1900’s, Obsello excludes any artificial flavoring, coloring or essences and is distilled using quantities of wormwood that mirror commercial absinthe recipes from 100 years ago. During blind taste tests, Obsello received the highest rating on flavor, color and louche compared to the other readily available products in the U.S. With honey and vanilla undertones and a hypnotic velour texture, the taste of Obsello stands clearly apart from competitor brands. Obsello asks you to experience absinthe again for the first time. All alcohol sales and use subject to local city and state laws.